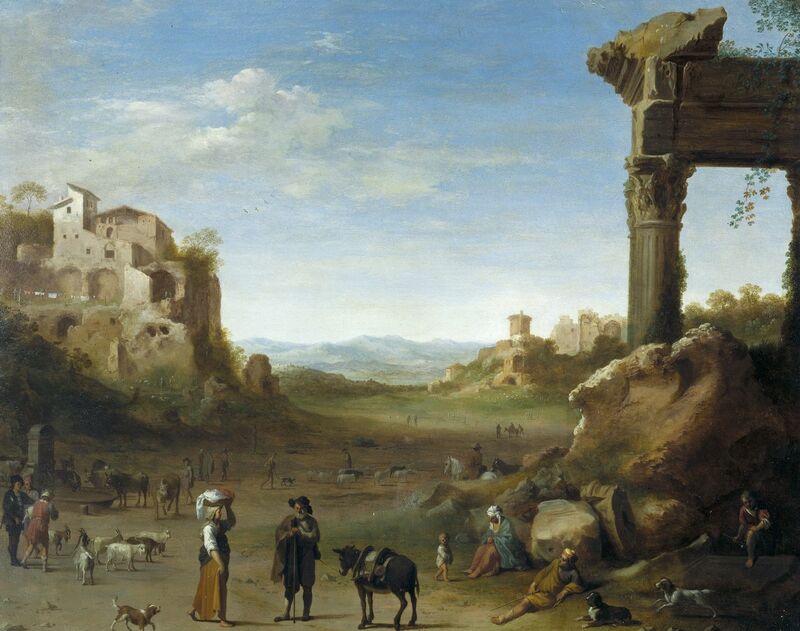 Poelenburgh was a Roman Catholic and (like many Italianate painters) a native of Utrecht, the most Catholic of Dutch cities. He studied there with Abraham Bloemaert before travelling to Rome in 1617, where he remained until 1627. Though a brightly coloured and light-filled scene, Poelenburgh’s imagery here draws heavily on the sinister and sepulchral aspect of the landscape immediately surrounding seventeenth-century Rome. The houses to the left grow out of the ruined Roman arches which themselves rest on monstrous rock formations. The consistent brown colour of the middle distance and imprecise form suggests that all human architecture is destined to melt into the sands of a giant hourglass. This is certainly an imaginary view, but the fountain to the left was designed by Giacomo della Porta and installed in the Campo Vaccino in 1593 to serve the cattle market.